Recently, I read an interview in which Patrick Viera was quoted as saying that Arsenal has the ability to beat any team in the world. It was worthy praise from a man that the Arsenal faithful are divided about his current status -legend or traitor. There was a caveat at the end of that quote, "...but they also have the ability to lose to any team in the world too." Much as I hated to hear it, especially coming from him, I knew deep down that it was the pure, hard, arrant, unadulterated truth. Norwich away, last Saturday was proof if any was needed of what he was talking about. We have gone to Anfield this season and beaten Liverpool convincingly, were unlucky not to come away with all three points from the Etihad, and were unluckier still to lose at home against Chelsea. Then we go off to Carrow Road to face a Norwich side that had not won a game all season and were lucky not to be beaten by more than one goal. It's a now familiar déjà vu. Beat Chelsea today and lose to Fulham tomorrow. Beat United today and lose to Wigan next. We've seen this way more times than is healthy for a club like ours. We can spend all week analyzing what went wrong at Carrow Road last Saturday; the unadorned truth is that we went to sleep when it mattered. 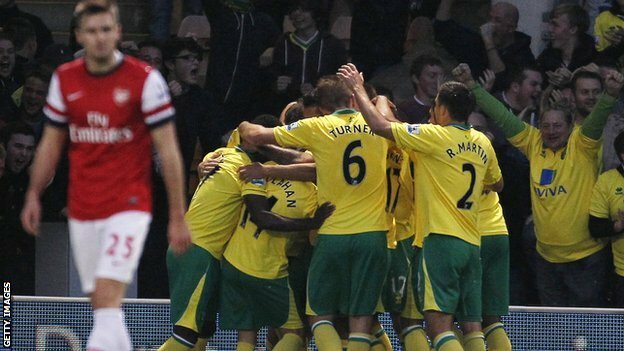 The team was ill-prepared mentally for the kind of challenge that Norwich put up. At the back of our minds we were facing a team that had not won a game all season and we never thought for a second that they were going to start with us. It wasn't just the team, it was every single one of us who is a fan of this club. Everybody who made a prediction before the game predicted a big win. I predicted 3-0. Damn, those Canaries made us eat our words. It's a lesson learnt. Let's hope it stays learnt. There are thirty games more to be played in the Premier League. We just simply can not afford that kind of mental laziness going forward. Tomorrow, we face Schalke in the Champions League. No better place to start. And it isn't just about winning Schalke tomorrow, we will need to sustain any positive result by going into the next game as if it was a Grand Finale -that is what Champions do. That is the same spirit that any would-be challenger must exhibit. Nothing less.